Thanks for catching that, Matt. I'll create a corrected graphic! This is a great example of how some forecasters simply look at MOS guidance & put those figures down on their forecasts. As stated before, I have a ton of respect for individual forecasters who are not afraid to contradict some of the MOS figures and go out on a limb with their predictions. Sometimes they will be right and sometimes not, but often, these forecasters attempt to blend their gut feelings with model guidance. In other words, they try to go the extra mile and don't mind putting in a little extra effort into their forecasts. Simply utilizing model guidance verbatim is flat out lazy. As for Matt's comment, he is right, but the general public could care less what the temp was at midnight. They care about the afternoon high temp. Novak, I appreciate your comment about MOS data. I was watching that from time to time and looking at a couple of the models to see where the origin of the warmth would be, than used the interactive snowfall maps to access the snow pack where the warm air would have to pass over. Needless to say there was precious little snow pack available and where it was, it was spotty at best. MOS guidance was actually showing Austin at 53, Lakeville at 52 and Blaine at 51. Something was seriously amiss as there was a good snow pack on the ground here in the north Metro. I checked all the tv outlets the night before (using their web sites if I could not catch their forecast live) and thought they all had a 90% bust potential, especially when I saw the previous days highs in NE Nebraska at 58 or 59°. Oh well I'll get off my soap box now. It will be interesting to see how many high temps will fall next week. Take a look at Paul Huttner's last two post's. Sound's like he has chucked MOS guidance out the window, using 850mb temps to make a surface forecast, among other things I'm sure. Kudos to him!!! And actually I think he is latching on to a warmer solution than most. As it sits right now I'm forecasting 75 for next Friday, and the GFS has finally come around to the Euro's idea on how it handles the MJO. Until we have a -AO or some kind of blocking over Greenland to slow things down, look at the MJO to help with the forecast. The MJO has been a awesome tool since about Jan. or even earlier. I like next weeks forecast at classic.wunderground.com. Next Friday they are saying a high of 79! Oh yeah! Bring it on!!!! 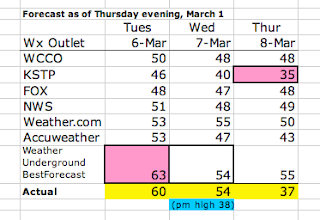 Heres one for all you research peeps,since we are still technically in winter,what is the longest stretch of above freezing temps in any given winter season at MSP in terms of hours/days,looking at all the going 7 day forecasts and even ones that go further(accuweather/weather.com/wunderground)I dont see a time that we fall below freezing after this morning going out at least 15 days,remarkable!Winter and everything that goes with it is over in my books,starting this morning spring cleaning is the name of the game,inside and outside,this was a sad year to be a snow lover like myself.